Each knee joint has two crescent-shaped cartilage menisci. These lie on the inside (medial) and outside (lateral) edges of the top of the tibia or shin bone, also known as the tibial plateau. They act as shock absorbers for the knee as well as providing support and stability for the joint. Injuries to either meniscus can prevent normal use of the knee. The lateral meniscus is less prone to injury than the medial meniscus because it doesn’t attach to the lateral ligament like the medial cartilage meniscus attaches to the medial ligament. A tear of the lateral meniscus can occur during twisting movements, direct impact to the knee joint, deep squats or due to degeneration of the cartilage in older athletes. A cartilage meniscus tear can occur happen in different ways and result in different types of injury. Degenerative Changes may lead to edges of the menisci becoming frayed and jagged. A longitudical meniscus tears is a tear that occurs along the length of the meniscus. 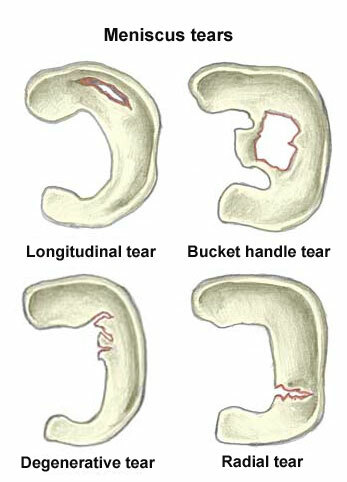 A bucket handle tear is an exaggerated form of a longitudical tear where a portion of the meniscus becomes detached from the tibia forming a flap that looks like a bucket handle.